Press Briefing in the Office of Chief Prosecutor, International Crimes Tribunal Bangladesh, Old High Court Building, Dhaka. Greetings from Chief prosecutor and Prosecution Team of International Crimes Tribunal. 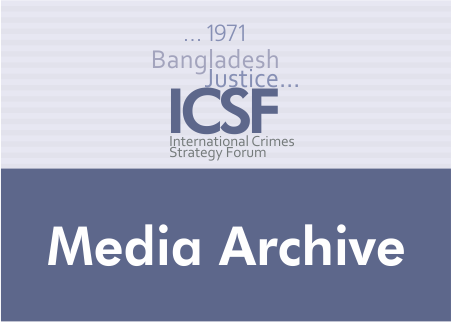 During the liberation period, crimes against humanity and genocide like murder, salvery, confinement, kidnapping, torturing, looting, arson occurred amongst the general unarmed people of Bangladesh which astonished the world. The people who assisted in committing those crimes and performing those crimes, the descriptions of which are available in the voices of suffering people of Bangladesh and also published in different Bangladeshi and foreign media during 1971 and afterwards, have been brought before the trial after 3 years of our liberation war. You all know that Tribunal has been established for bringing them before trial by International Crimes Tribunal Act- 1973 with the decision of the parliament, for fulfilling the wish of the general people of Bangladesh. Dear journalist friends, at present two Tribunals are doing the work of trial in the presence of you and interested observers of foreign country from 2010, without any kinds of partiality by proving the highest fairness. In Bangladesh 30 lach people [3 million] were killed, more than 2 lach [200,000] mother and sisters were raped, more than 4 lach [400,000] mothers and sisters were tortured in many ways, 1 crore people [10 million] were forced to leave the country and a lot of other people were subjected to many kinds of torture during liberation period, from those people means “For getting rid from them of the curse of not doing the trial of the crimes against humanity”, the government has taken steps to bring those criminals under trial. The Tribunals are going on in sovereign and independent Bangladesh by facing the conspiracy, defamation and false games of people in Bangladesh and foreign countries. 1. Within the act and rules, accused has been ensured the inpendence to represent himself in the trial by more than one lawyer as is his choice. 2. Before framing of the formal charge, statement of the witnesses, list of the witnesses and other kinds of documents like statement, report, photographs, paper cutting, all those have been supplied to Defense Counsel. 3. According to prayer of under trial accused, they are given medical treatment, transport favorable to health and even some time they are allowed to eat food supplied from their home. 4. According to the rules of jail code they are given division and also books supplied from their house according to the demand of accused. 5. During the period of trial, even lawyers and his relatives of accused has been allowed to talk with him in the Tribunal and also the jail. 6. Following application of Investigation agency and prosecution, questioning of the witness in the present of his lawyers and doctors has been allowed from 10 am to 5 pm to give priority the interest of the accused by Tribunal. With that it has been ensured that law and rules must be followed when taking the statement of accused. 7. There is no rule of bail in the law of International Crimes Tribunal Act, even after that bail has been given to accused like Alim. 8. For the first time, chief and cross examination of the witnesses has been shown on a computer monitor by keeping monitor in front of accused, lawyer of accused, prosecutor and the members of the Tribunal. 9. Copy of order, chief examination and cross examination are being obtained by Defense Counsel without any cost. 10. Both tribunals are founding the example of impartiality and fairness by protecting the rights of accused depending upon the application the Defense Counsel. Dear journalist friends, You are not unaware that crimes against humanity during 1971 of some accused specially the leaders of Jamaat-e-Islami are well-recognized within and outside the country, but they are trying to raise questions about the trial process within and out of the country and also they are trying to frustrate the trial of accused. They are continuing to mislead donor groups, human right organization and world public support by appointing lobbyist giving them huge amount of money. In the recent times Jamaat-e-Islami and Islami Chatra Shibir have started to commit terrorism by destructive activities and contrary to law and order worked for cancelling theTribunals and releasing Professor Gulam Azam, Motiur Rahman Nizami, Ali Ahsan Muhammad Muzahid, Muhammad Quamaruzzaman, Abdul Quader Mollah and Delawar Hossain Saydee. Last 5 and 6 November, their destructive activities which were published within and outside the country by media, are the parts of their trying to dismiss and make obstacle in trial proceeding. Dear Journalist friends, Lawyers are the assistant of trial proceeding and continues to be the guardian of protecting the integrity of the court. Every lawyer is directed to establish human rights, protection and rule of law. In recent times the Defense Counsel are creating a confusing situation in the Tribunal by their unprofessional activities and have forgotten their professional responsibility because most of those appointed defense counsel are involved with the politics of Jamaat Islami. They are not hesitating to use the elected representative lawyers association in assisting their activities. In the recent time during the argument time of a certain case, in relation to a witness who is not the defense witness and whose family has lodged a G.D against the defence, on 5 November they made a so-called drama of kidnapping that witness in the gate of Tribunal and by this issue some Defense Counsel of Tribunal-1 have tried to create a confused situation in Tribunal, then Tribunal has taken proper steps against them according to the law in 6 November. Dear journalist friends, When the defense witnesses were giving their statement and Prosecution were cross-examining them in the case of Delawar Hossain Saydee, most of the Defense Witnesses said that how, with whom and whose assistance, they have come to give testimony in the Tribunal. Prosecution team can say strongly that no Prosecution Witness told in their statement or in the time of cross-examination that they came with Prosecution or his car to give testimony in the Tribunal. All the people of the country have known by you that last 5 November Jamaat Islami and Islami Chatra Shibir have operated destructive activities, attacking upon police, hijacking the arms of police, burning and breaking the law and order by causing damage to human life and goods for dismissing the trial proceeding and releasing their leaders. That certain day was not fixed for that witness and it is created question in the mind of all about taking steps for bringing Sukhranjan Bali by the car of Defense Counsel Mizanul Islam in the Tribunal as Defense Witness. That Sukhranjan Bali was missing from his area in last four months and a G.D was lodged by his family about him being missing and Defense Counsel Mizanul Islam has cross-examined the Prosecution Witness about this G.D, then as a lawyer it was his responsibility to inform law enforcing body and present him in the Tribunal by the help of them when he got Sukhranjan Bali but he did not do that, so it is amazing, mysterious, unbelievable and for special purpose, for that their claiming of Kidnapping Sukhranjan Bali is not acceptable. It has been proved to every rational and sensible people of the country that unacceptable drama of Defense Counsel about kidnapping witness and destructive activities of Jamaytee Islami and Chatra Shibir in outside the Tribunal, are the part of trying to dismiss the Tribunal and releasing their leader unlawfully by postponing trial proceeding and Defense Counsels will not avoid the responsibility of those destructive activities. In this situation, we are calling all to perform professional responsibility more carefully for protecting the holiness of the Tribunal and to become more reliable in establishing Human Rights and Rule of Law. Thanks by Advocate Golam Arif Tipu Chief Prosecutor International Crimes Tribunal Bangladesh. Date- 08-11-2012. Time: 1:00 pm.